PCMag posted its Fastest Mobile Networks 2018 report this morning, concluding that Verizon is the overall champion among the four major US carriers. On PCMag’s scoring system, Verizon ranks at a 99, followed by T-Mobile at 93, with AT&T coming in at 88 and Sprint well behind at 75. Those numbers don’t really indicate how well each carrier performs in certain areas, so in the report, PCMag breaks the US down into various regions. Each region is then ranked with a winner, with Verizon stealing the show in all but one region of the US. T-Mobile was able to steal a win in the Southeast part of the US, which includes Tennessee, both Carolinas, Alabama, Georgia, and Florida. Other than that specific region, though, Verizon had the best scores. For specific cities, and we’ll just throw a few of the big ones, places like New York City and San Francisco appear to be covered extremely well by each carrier, but things get pretty spotty for select networks when you head out into the suburban and rural areas. 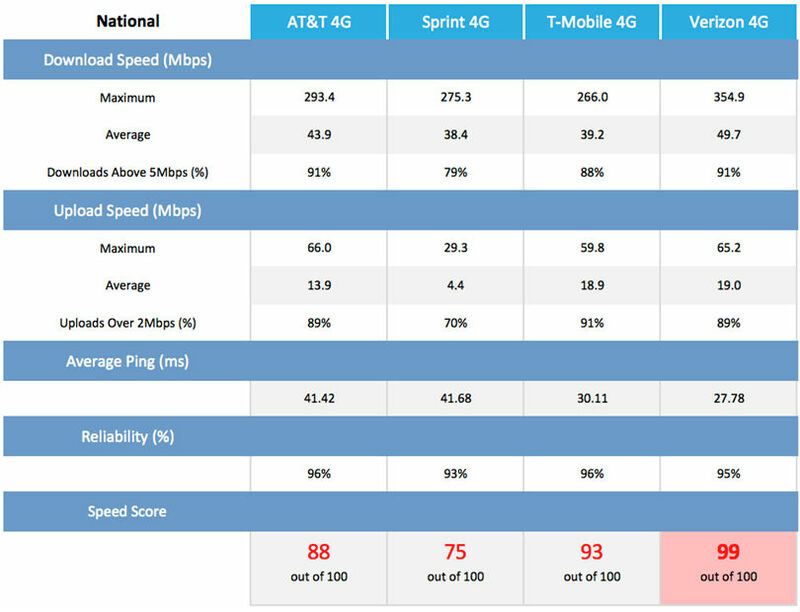 For example, suburban and rural areas in the Northwest are basically terrible for Sprint, capturing a score of just 54 out of 100. On the other hand there is Verizon with a 98 out of 100 rank. For the suburban and rural Southeast, AT&T and T-Mobile tie with a 94 out of 100, with Verizon trailing ever so slightly at 93. And because we’re egomaniacs over here, let’s check out Portland, OR. T-Mobile is a clear winner in this area, scoring a 97 out of 100. The next best score is Verizon at 87, followed by Sprint at 85 and AT&T at 80. PCMag’s main takeaway from this report seems to be that each carrier has solid download speeds these days, but some (mostly Sprint) could benefit from improved upload speeds. And while T-Mobile has been methodically building out its network to better serve mobile customers, AT&T has been focused on creating a network for the future, one where cars, homes, and entire cities can benefit in the long term. For the complete breakdown of these scores, check out PCMag’s report by following the link below. YES: Google is Adding a Dark Theme Toggle!